Hi, Thats the same Ailsa,she had 3 brothers ,John, henry, and I cant remember the other as he was a lot younger than me.Ailsa and Matt had the Reaper.Both are now dead,Ailsa's mother also Ailsa ,died a coupe of months ago Sam. Overwhelmed by everyone's responses already ! Especially the quick answer to the Ness Gardens name question. I remember the Arthurlie Place fire myself; it was the first local event I do remember. I was very young, about four or five, so I can't date it exactly. It was still smouldering as we passed on the bus , and the conductress was telling my mother that people had died and others had been rescued. There was actually a flight of steps with iron railings just beside there , from the bridge down to Arthurlie Place; we'd often used them as a shortcut, but I never wanted to go that way after that. PS We do now have an accurate date for the fire: July 2nd 1962. See here. I didn't think you'd all want to be bored with details about Ardrossan Road itself ! There's been quite a lot written about Dr McCann and the other doctors in the past , even by me; but it's true that nothing was too much trouble for him. My father remembers a time when my sister wasn't well, and he said he might just check on her later. Very late that night, the doorbell rang, and there was Dr McCann asking " how is the wee girl "; his evening surgery had gone on very late, but he still kept his promise. I'll note in passing also that Ardrossan Road was a favourite spot for doctors to live, because Dr Rankin and Dr Campbell also lived there. It turned out Dr Campbell's sister was my grandfather's GP in England; smaller than that the world doesn't get. Also along Ardrossan Rd I remember there was a house called " Stella Maris "; Star of the Sea in Latin. I'm indebted to a previous post by Sam for the knowledge that Our Lady Star of the Sea is the correct name for the Catholic church opposite Ness Gardens and mentioned by Morag. It stood amid trees then; not so much so now, I gather; and there were always plenty of churchgoers gathered outside when we passed there on a Sunday walk, on our way to Cavani's for the papers. Where we'll be going soon , but not yet; I'll divert down Winton St first. But not till next time ! Last edited by down south on Mon Nov 10, 2014 4:40 pm, edited 1 time in total. The late 50's it would have been. I was nearly right! I wasn't aware that someone had died in the fire though. I remember Ailsa Lee and Matt. My father was a friend of his and as a kid I was at the farm a good few times. We didn't use the road up to Chapelhill but walked along a path a little further down (accessing from Dalry Road) that took you up through trees to the farm itself. Your memory serves you well about Ardrossan road , the house called Stella Maris was number 44 it belonged to John Murray or" papa john" as he was known , he named the house after St Mary's he was a devout catholic and attended mass almost every day , he was the son of Patrick Murray one of the Murray Bros , fish merchants and auctioneers the name which was on the front of the house for many many years after his death is now gone . "Ness Gardens" was named after Mrs. Annie Ness, the schoolteacher's mother. She celebrated her 100th birthday in 1961 and died one year later. My aunt was a good friend of Mrs. Ness and her three daughters. No worries, Irene; we're in no hurry with this walk, and useful info like yours will be welcome at any time. Further PS : more information about the cottages, including the fact that they were demolished around 1960, is to be found here . Round the corner in Winton St was where the Clyde Coast buses started from. 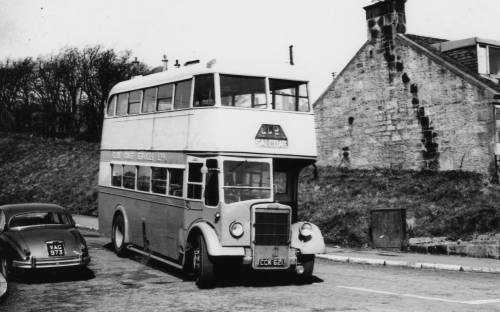 The service buses to Largs were (mainly ) double deckers in blue and silver; what shade of blue would you call it, wedgwood or lavender maybe ? As I remember it, their single deckers came in quite a different colour scheme, cream with red lettering and decorations; or was that the SMT ones ( still different from their double deckers, if so ). Also from here started the coach tours to the many destinations listed in the advert; including Mystery Tours. The most mysterious place I ever saw a Clyde Coast bus was about fifteen years ago, sitting in a back-street car-park in the Greater Manchester town of Stockport. What's THAT doing HERE ? , I thought as we drove past, with a nostalgic sigh ... Even if they'd been selling off their old buses it seemed such a wildly unlikely place for one to end up. Talking of which, I'm not quite clear if Clyde Coast buses still exist; or have they been swallowed up by some bigger outfit ? Last edited by down south on Mon Oct 30, 2017 4:32 pm, edited 3 times in total. One of their buses, probably from around the time of the stroll. I don't know why I think this but it looks to me as if it's turning into Main Street, West Kilbride, just where the blacksmith's premises used to be. The 3rd Lee brother is Steven, I know all of them from the Westfield pub. I guess the Clyde Coast are still in business. I wonder who is behind the business now? I remember 3 of the co-owner families - Shields, Hogarth and McGregor. Anybody know if there was any more? Hi, Was there not an other owner by the name of Fraser, Sam. I think you're right about Fraser.